OVER THE OPEN PACIFIC AT THAT TIME. This came to my attention as I was reading through SUNY Albany MAP posts. This vague and undefined "energy" terminology has been appearing in WR FDs the last couple of years and perhaps forecasters out here have picked it up from HPC? Regardless, what the hell does above "energy" verbiage actually mean? 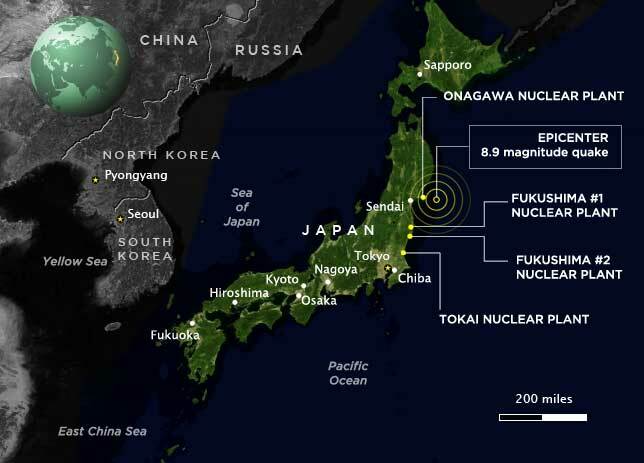 Jason Furtado reacted on MAP: What is this "critical energy"? I seem to have missed this chapter in my Holton dynamics textbook. 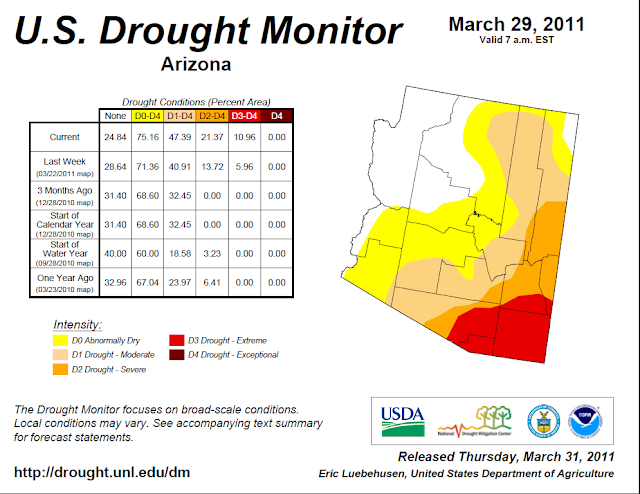 A quick summary of March 2011 here at the house - total rainfall was 0.08" on one day. The month was mild in comparison to February. Low temperatures were 40F or below on 18 mornings and only 5 mornings had freezing or below temperatures. Coldest morning occurred on the 1st with a low 29F. It has been a very dry first quarter of 2011, which is not unusual for La Nina years. Total rainfall at house for 2011 - 1.13", thanks to a small convective storm on January 31st which dropped 0.76" in less than an hour, which was the total rainfall for the month. 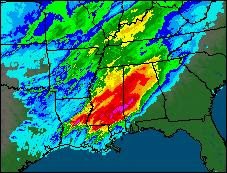 During 2011 there have been only 4 days with rainfall - or a daily observed POP of 4%. The first half of the water year (the water year begins October 1st) has produced only 3.20" of precipitation here at house - but we're somewhat wetter than will be the official records taken at the airport. The latest drought monitor data - see figure above - indicates that southeastern Arizona is suffering extreme drought conditions. And here I thought 3-Buck Chuck was Doswell's house wine :). Nope, we don't call it the "Marfa Front" anymore. Owing to the drought and the northward creep of the Chihuahuan Desert, it's now called the "Metroplex Front" (actually, the picture shows a general area of thrust faulting of Paleozoic strata during the Ouachita-Marathon orogeny with extensional basins in the foreland further north, but hey...). You're right, there are few people; being somewhat misanthropic, I like it that way. 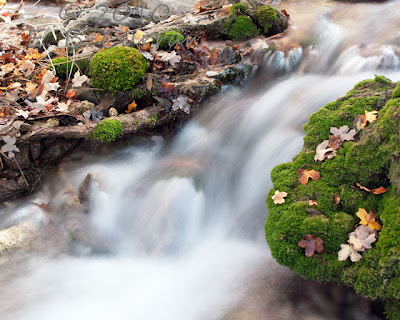 Plus there are some beautiful areas if you know where to look. 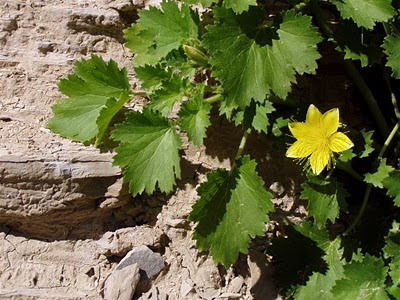 This is a pretty desolate region, especially if you're headed cross-country on I-10 or I-20, but off the beaten path there are places of great beauty, and few people there. This is, after all, Cormac McCarthy's "No Country for Old Men!" Photos Brian? Wonder if that's the famous Marfa Front in the Big Bend? Even though I have been away from NOAA for years now, I sometimes dream that I'm still at work for them. A dream last night was very strange. I dreamed I was in Washington D.C. at meetings where the topic of discussion and planning was the merger of the National Weather Service with the United States Postal Service. Apparently the reason and motivation for this merger was that NWS employees could work at the Post Office and deliver mail during fair weather days. Strange brew or bad indigestion. "Postal delivery trucks could carry one or more sensors to gather and upload useful data according to an article appearing in Popular Science magazine this month. http://www.popsci.com/technology/article/2011-03/postal-network-usps-trucks-could-monitor-air-quality-road-conditions-and-traffic Among the uses: detecting and mapping pollution, weather, RF signals (cell, WiFi, broadcast), gas leaks, and road conditions, as well as homeland security uses like detecting radiation sources or dangerous chemicals. The wide-ranging idea was developed and described in a recent white paper http://www.prc.gov/prc-docs/Ravnitzky_Postal_Sensors_Paper.pdf A workshop on this topic is scheduled for April 12th in Washington, DC http://www.usmesnet.org/meeting.html This month, the Postmaster General sent a letter to Senator Thomas Carper, Chairman of the U.S. Senate Subcommittee that oversees the Postal Service, expressing interest in exploring this concept." 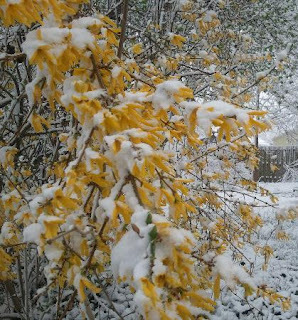 Snow continued yesterday (Saturday March 26th) in St. Louis. 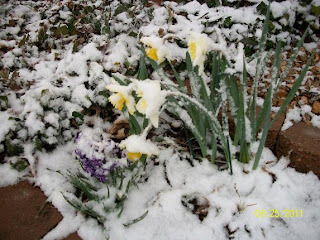 The above photos show accumulations on Spring flowers on Friday and Saturday (no credits available). March 2011 is going to end with a fast-moving series of 500 mb short waves crossing the central and northern portions of the western US, leaving southern Arizona well-removed from any weather of significance. However, once again (way out at 7 days) the ECMWF and GFS are quite different. This time however, the more usual situation is present with the ECMWF forecasting a much stronger 500 mb short wave approaching the Southwest. The operational member forecasts from the two models are shown above, with ECMWF at top.The forecasts are valid at 0000 UTC on Sunday April 3rd. The ECMWF is almost 200 m deeper near the LA Basin - so another bit of meteorological interest, but still at long ranges. Light, wet snow this morning in the St. Louis area. View above is of Lambert Field (where I had my first job with the Weather Bureau, so many years ago). So what's southwestern about this? 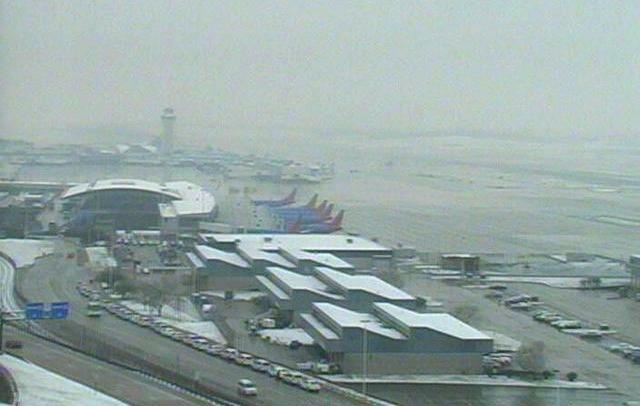 Only the five 737s of Southwest Airlines lined up near the terminal. Shown above are the ECMWF forecast at 500 mb for 168-hours from 0000 UTC last evening (valid at 0000 UTC on 31 March - top), and the same forecast from the GFS model (bottom). Both forecasts are from the operational versions of the models. It is of interest that the GFS is deeper than the ECMWF for this forecast cycle - a reverse of the usual situation. The forecasted vorticity maximum in the Southwest is considerably further west and south of that forecast by the ECMWF. The upstream ridging over the east Pacific and northwest North America is considerably stronger in the GFS (heights over southwest Canada about 150 to 200 m higher in the GFS forecast), leading to the stronger downstream digging. Several of the GFS ensemble members are even more aggressive, forcasting a deep, 500 mb cutoff over the Southwest at this time. So, something to watch in the next few model runs. Edited Friday morning to add: The 144-hour forecast runs of the GFS and ECMWF are now very similar, with the GFS having become quite like the ECMWF, which continues to have the vorticity maximum along the Colorado/New Mexico border as per above. In an earlier post I had compared the GFS (top) and ECMWF (bottom) 500 mb forecasts at 144-hours that were valid at 1200 UTC Monday March 21st. The two were quite similar, with the main difference being the orientation of the west coast shortwave trough. The verifying analysis (from Univ. of Wyoming's upper-air page) appears, to me, to indicate that once again the ECMWF had the edge over the GFS. Both forecasts were, again in my opinion, extremely accurate given that the forecasts were for six-days out. 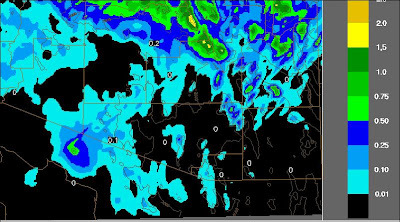 On the very short-term, the NAM and U of A WRF forecasts on the mornng of Monday 21 March 2011 were both somewhat off in ther forecasts of precipitation accumulations. The NAM was a bit too optimistic with amounts across southeastern Arizona, while the WRF-GFS was on the low side. An average of both models' QPF forecasts for period ending at midnight Monday night came out about right - according to my very subjective eyeballing of the forecasts. 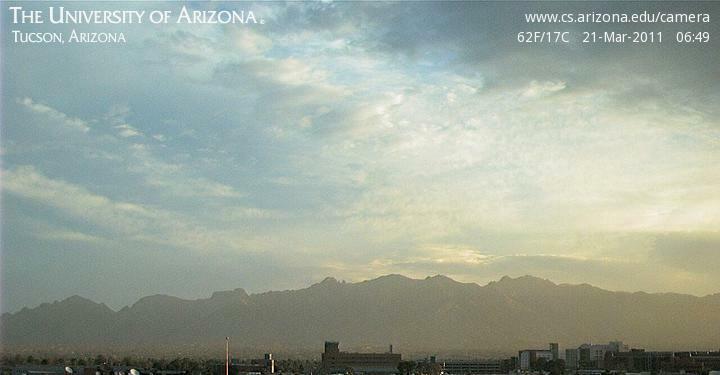 Strong Pacific front came through metro Tucson around 5 pm yesterday afternoon, after a very windy afternoon. Top photo from campus shows view to north about time of FROPA. The temperature and dewpoint time trace from Atmo is shown in middle. This morning here at house it is cool and damp and quite pleasant with much cleaner air. 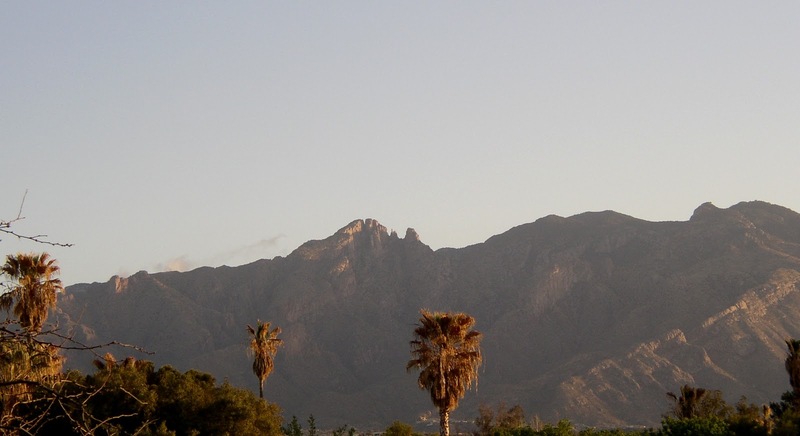 Bottom photo shows west end of Catalinas with some early morning sunlight and a tiny bit of fractus cloud. Most notable yesterday in southeast Arizona were the winds out ahead of the front. Gusts of 40 to 50 mmph were common: Gutherie RAWS station reported max of 65 mph; Ft. Huachuca had 55 mph; Atmo rooftop anemometer recorded 61 mph. The NWS ASOS stations at Douglas and Nogales are out of service, so I don't know what max gusts were at those locations. Rainfall coverage across eastern Pima County was quite good - 85 of the 93 ALERT gauges measured precipitation (~90% coverage). But amounts were quite light, except for higher elevations. Amounts across the metro area were around 0.10" or less - we had 0.08" here at house, as did Atmo. In the higher elevations, mostly in Catalinas, 11 gauges measured 0.25" or more and 2 gauges had over 0.50". 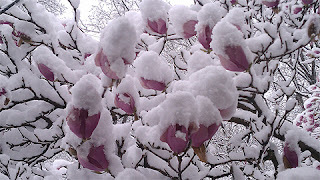 But a dissapointing event wrt rainfall/snowfall, particularly since it is possible that this was the weather for March 2011. The top graphic is a plot of surface potential temperature (from SUNY Albany weather pages) for 20 UTC this afternoon (21 March 2011). Below that is a 20 UTC surface plot from NCAR RAP. I like to use surface theta for surface analysis in the west, since it can highlight features that are masked by varying surface station elevations. The SUNY objective analysis smears out the horizontal gradients however, and the actual front has a very strong theta gradient over a much smaller distance, i.e., the gradient between Tucson and Phoenix captures the frontal zone. The eastern Pacific blended PW product (third graphic) indicates that a narrow plume of higher precipitatble water extends into Arizona along the frontal zone. However, the current regional radar data (bottom) indicate that, at present, the front is associated with a broad band of weak rainshowers. 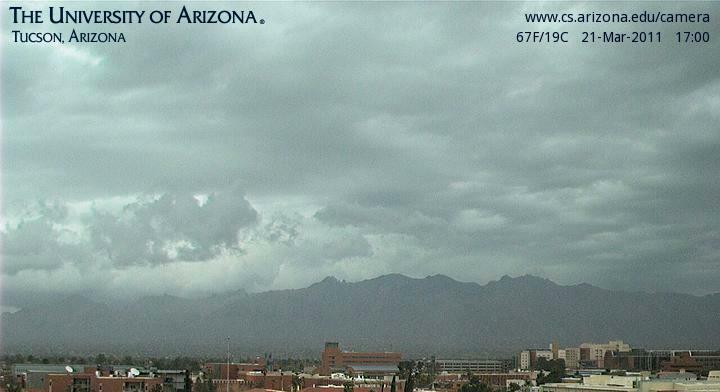 These may strengthen over the next couple hours as the front advances eastward across eastern Arizona. Skies are dirty and chaotic this morning as the Pacific trough approaches southern California. The U of A Atmo WRF-GFS continues to forecast rainfall (bottom shows total forecasted through 5 am tomorrow morning - Tuesday the 22nd) only for higher elevations, with nothing forecast for the Tucson metro area. At 6:50 am MST this morning the Atmo rooftop anemometer had gusts to 44 mph - so a very windy day on tap! More later. It has been a dreary, very dry (currently 82F at airport with -8F dewpoint giving RH of 3%), day this Sunday with gray and dirty skies. Looks like more dust coming by tomorrow and perhaps some showers late in day. The U of A Atmo WRF-GFS forecast from 12 UTC this morning, top, continues to forecast precipitation through 11 pm Monday night to occur mostly on the mountains, with no rainfall right in the metro area. The model forecasts a slight touch of snowfall at only the very highest elevations. The coarser resolution NAM forecast (bottom) for same period has the precipitation smeared out spatially, but with this considered, the two forecasts are quite similar for southeast Arizona, indicating another event much like that of 27 February (the last rainfall here). SUBSIDING SINCE ABOUT 1 AM BUT ARE STILL QUITE STRONG. The model forecast runs from midnight last night are compared above for the WRF-GFS (Atmo high-resolution version) of the WRF model and the midnight run of the NAM model. 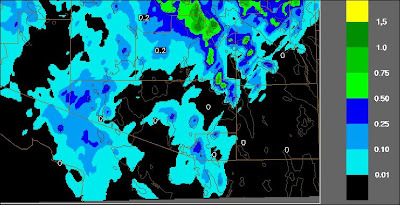 The WRF forecast (top - total precipitation for period) indicates that the event is over by midnight on Monday night and predicts precipitation only at the higher elevations of southeast Arizona. The midnight run of the NAM model (bottom) is quite similar, although about 6 to 12 hours slower than the WRF, predicting precipitation mainly northward from the Catalinas. Neither model indicates much happening across the Tucson metro area, except for a strong frontal passage Monday afternoon or evening. But of note - the GFS ensemble members' (except for the operational member) forecasts are more agressive, with 11 of 12 forecasts indicating a frontal band of showers moving across southeastern Arizona late Monday into early Tuesday. The ECMWF forecasts a very strong frontal passage across southern Arizona (I don't have access to ECMWF precipitation forecasts). So, even though the event is only a couple days away, the forecast for metro Tucson remains very difficult. I will note that when the GFS ensembles have indicated 90 to 100% of the members' forecasting precipitation, we have almost always had measureable rain here at the house. So, I'm hopeful that we'll have at least a light rainfall here. The system that will affect Arizona at the start of next week is currently spinning away over the Pacific to the west of Washington state (see WV image at 4 pm MST top). The NAM 300 mb 12-hour forecast valid at 5 pm MST this afternoon (middle) has forecast the system to be further north and east of where it appears to be, at least in the WV imagery. A strong 300 mb jetstream is forecast to be approaching the cutoff from the northwest, i.e., the feature that will help the system dig down the coast. The current water vapor loop shows the cutoff to be moving slowly southeastward at this time. The NAM 60-hour forecast for 500 mb (bottom) indicates that the system will dig nearly due south and be off the northern California coast at 5 pm MST on Sunday (March 20th) afternoon with central heights lower than 5220 m. Thus, a very impressive system. However, after 60 hours the models forecast the system to weaken, become an open trough and move rapidly eastward. The GFS ensemble forecast from this morning shows that most of the members forecast a frontal band of precipitation to move eastward across southern Arizona Monday night, quite like what happened with the last system in February. However, most significant precipitation remains to the north. There is another large plume of subtropical moisture over the eastern Pacific that may be pulled into the digging cutoff. So it is yet another sittion that we'll have to watch evolve as it approches the Southwest. Srong return flow from the Gulf of Mexico has brought cool and moist mT air north across the southern Plains during the past 24 to 36 hours. Weaker flow aloft has advected a cT, elevated mixed layer eastward over the mT air mass. Thus, the soundings above (DRT to FWD to TOP bottom to top) all illustrate classic capping inversions (or Lid structures), with an mT boundary layer topped with a deep, high-lapse rate, old boundary layer. All these soundings are fairly stable this morning and the mT air will need some serious heating before there's much CAPE available. Just a reminder that the problems with the RRS sondes have not gone away. There are a number of eastern US soundings this evening with superadiabatic layers aloft, at the top of a moist layer. The sounding from IAD is shown above. Soundings with similar problems were taken at PIT, RNK, GSO, MHK, and even at WAL. I'm not sure what sonde is being flown at WAL, but it too suffered from a wetted temperature sensor and subsequent evaporative cooling.. It appears that several short waves at 500 mb will kick out of the developing trough along the west coast this week. These will bring more moutain snows to much of the West but stay north of Arizona. However, by 5 am next Monday morning both the GFS (top) and ECMWF (middle) operational models forecast a stong system to be over southern California. At this time the ECMWF is a bit deeper with this short wave/cutoff, but the interesting aspect of the forecasts is that the ECMWF forecasts a strong negative tilt that provides significant forcing for vertical motion over the Southwest. The GFS forecasts a positive tilt to the trough and tends to move it east-northeastward further north than does the ECMWF. The spaghetti chart for the GFS ensemble at 144-hours (bottom) indicates that the operational member is an outlier, lagging behind the other members that have the system further east. As usual, I expect that the ECMWF will perform better at 144-hours than will the GFS. At least something to watch for out on the horizon. Strange precipitation quirk - I was just looking back through my weather log and note that no month since October 2010 has had any precipitaion (not even a Trace) here at the house during its first half - and March has fit right into this pattern. 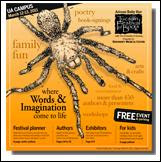 Tucson Festival of Books going on today - Saturday March 12th and tomorrow. Many activities and book signings involving hundreds of authors. Elmore Leonard, Jim Harrison, Leslie Marmon Silko, Martin Cruz Smith, Robert Crais and many, many others. On the Mall at the University of Arizona; head on over for an interesting day! Perfectly clear skies this morning. The surface dewpoint fell to -3F yesterday afternoon giving an RH of 3%. Yesterday morning's low was 32F at the house (versus 46F at the airport) - the airport's high of 87F means a diurnal temperature range here at house of about 55F! This morning (Friday March 11th) the low here was 38F versus a balmy 50F at the airport. Even the long-range model forecasts don't indicate much to get excited about until way out toward 10 days - which is too far out to pay much attention to. Very dry, so I need to water the plants that survived the great February freeze. My attempt at translation (see the 500 mb NAM analysis top and the 12 hour forecast valid at 5 pm MST this afternoon - 10 March 2011): The weak southern portion of a ridge that extends northward into Canada was overhead this morning and will move slowly eastward today. There is a persistent 500 mb high located from the eastern Pacific into central Mexico (actually, I don't see this feature at all in the NAM or GFS forecasts, and it appears that the Gulf of Alaska cyclone and short-wave troughs along the northwest coast are the dominant features impacting western North America next few days - regardless, not much to write about down here). 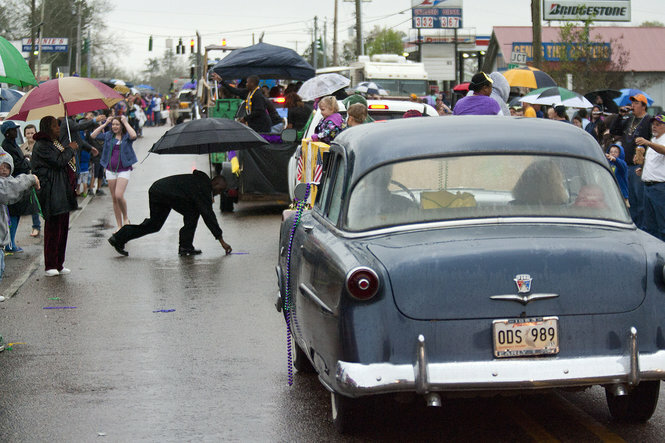 New Orleans had a rainy Mardi gras on Tuesday - above is photo of part of the parade from the Times-Picayune slide show of the festivities. March 9th). Reds and violet indicat 3 to 6+ inches of rainfall. Remaining parts of my two lost posts are too old now to be very relevant; so they've gone to the Recycle Bin. 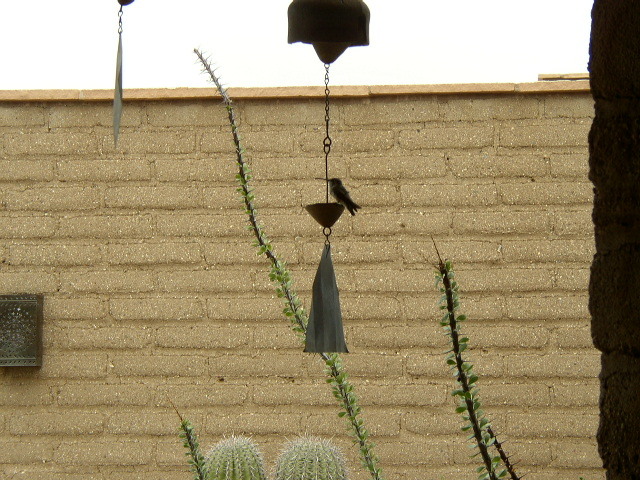 Hummingbird trying to get attention by ringing a Paolo Soleri wind chime.